Sterling Silver 925 drop style earrings, including long dropper gem stone set earrings and hook type earring droppers. Sterling Silver pink pearl and crystal stone set long drop hook type earrings. Long pink pearl and gem set drop earrings, 58mm dropper size. Sterling Silver Chandelier type Pink Crystal set long 40mm Drop style Earrings (pair). 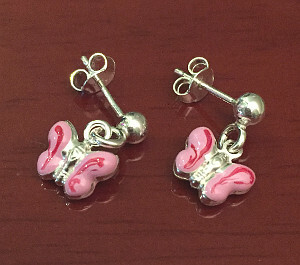 Enamel Pink colour Butterfly Sterling Silver 925 drop earring studs (pair). 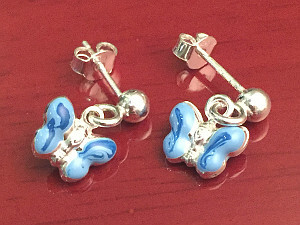 Blue enamel Butterfly Sterling Silver drop stud earrings (pair). 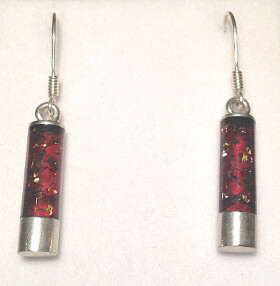 Sterling Silver Cylindrical Round shape Amber inlaid drop Earrings, approx 6mm wide by 40mm earring drop length. 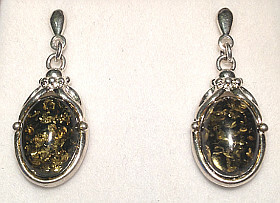 Sterling Silver Antique vintage design Green Amber set 32mm long detailed design drop earrings. Amber dimensions approx. 14mm x 10mm. 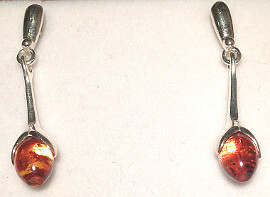 Amber set Sterling Silver Tulip stem design drop earrings, approx. 30mm drop length and 6mm wide.